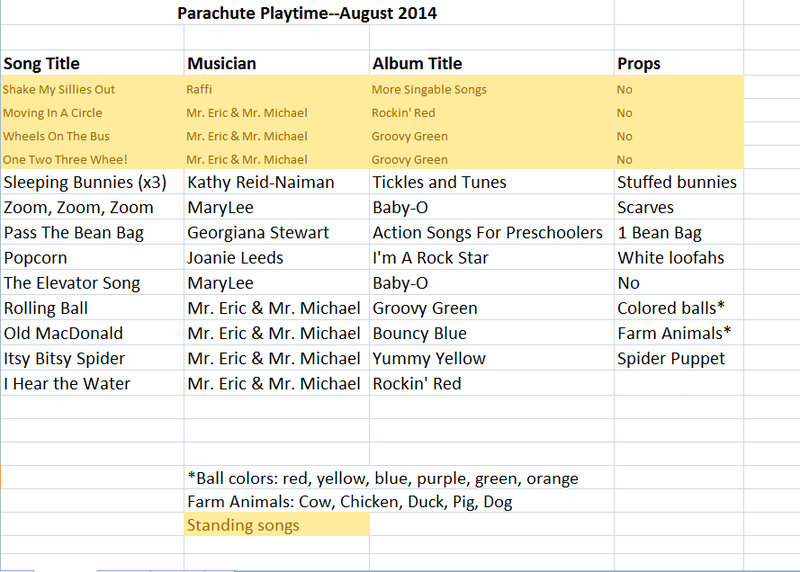 As I did last summer, I did a parachute playtime program again this year in August. 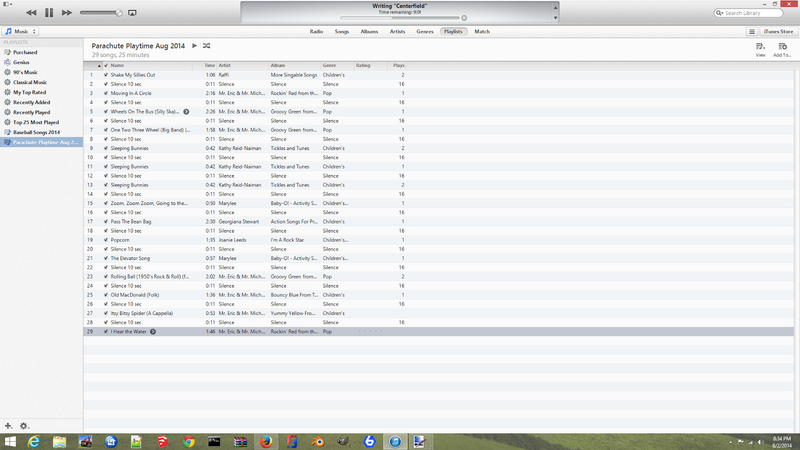 I incorporated a bunch of familiar songs and added some new ones as well. This year I used a lot of songs suggested by Lisa and Nicole, thanks ladies! I went with more recorded music this year as I have been slowly familiarizing myself with a lot more children's music due to having a little one of my own who loves to dance. So I had some favorites to pull from my own experience in addition to songs that I have used in previous programs with kids at the library. I added 10 seconds of silence in between songs in the hopes of regaining the kids' attention and being able to quickly dole out instructions. I downloaded a free MP3 of silence to accomplish this. It sounds ridiculous but it works! I also have used that MP3 to make a silent ringtone for my iPhone before since my iPhone did not come with that option. The silence was not critical to the success of the program but it adds a nice buffer and you can always skip to the next track if you're done talking earlier. I had 12 children register for this program but only 8 attended. They did a great job though! I loved looking around the parachute and seeing so many smiling faces and hearing so many laughs. Last year I sang most of the songs myself, but using the recorded music this year really helped me to better focus on the kids and enjoying the program. It also flowed better since I had the list of activities set and could follow my paper copy. I had tried to alternate high energy activities with slower ones to keep the kids from getting too wild and it worked. I would do this program almost exactly the same in the future. I printed off extra copies of my notes for the caregivers and they all took one copy. Everyone had at least one song they wanted to look for in the library or on iTunes! It wound up being a really fun way to showcase our music CD collection. Our program was a Thursday morning at 11:15. I'd love to try it as a family program on a Saturday or weekday evening though. Someday I hope to invest in one of the giant parachutes and be able to play games with the older kids. How much fun would a parachute program for tweens be?! We did "Shake My Sillies Out" and "Moving in a Circle" without actually touching the parachute as our warm up songs. I skipped "One Two Three Whee" and "Itsy Bitsy Spider". The most popular songs were "Sleeping Bunnies" and "I Hear the Water" which are both calmer songs, if you're looking for something a little more mellow to try with your parachute. For "Sleeping Bunnies," I used some stuffed bunnies and told the kids that they were sleeping on the parachute, then we yelled "WAKE UP BUNNIES" and started to bounce them in between "Wake up soon... Hop little bunnies!" They loved this and we did it more than the 3 times I had planned. What did you do for "I Hear the Water" ? Good question, Brie! We just moved the parachute like waves. So we started with bigger waves for "I hear the ocean" and moved to smaller waves to cool down as the song goes.